John died on 6 August 1916 in St Pierre-du-Bois, Guernsey, Channel Islands, at age 72.11 He was buried at the Cemetery in Torteval. [S871] FamilySearch, at https://familysearch.org/, "Channel Islands, Births and Baptisms, 1820-1907", Batch C06285-1, source film 473984 (accessed 29 Dec 2012). [S1136] Photo - Guernsey families, #L20 LENFESTEY family, submitted by members #148, Mr & Mrs J.W.SARRE. [S118] Census - 30 Mar 1851, UK census, ED 2 HO107-2531 Folio 393 p13 GSU roll 105981. [S540] Lloyd's Captains Registers 1869-1911 (Guildhall Library), at http://www.history.ac.uk/gh/capintro.htm, MS 18567, vol.9 1868-1870, 1872-1873; vol.21 1874-1879; vol.36 1880-1882. [S367] Census - 2 Apr 1871, UK census, ED 2 RG10-5769 Folio 51 p2-3 GSU roll 895838. [S1174] Government Publication - Crew Agreement. [S178] Census - 5 Apr 1891, UK census, ED 2 RG12-4706 Folio 51 p13. [S430] Census - 31 Mar 1901, UK census, ED 2 RG13-5317 Folio 63 p4. [S687] Census - 2 Apr 1911, UK census, RG14PN34763 RD636 SD1 ED6/2 SN25. 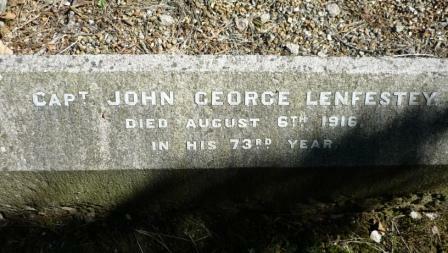 [S584] Cemetery Marker - John G Lenfestey / Maria Le Quesne, Torteval cemetery, Guernsey. [S340] Census - 7 Apr 1861, UK census, ED 2 RG9-4384 Folio 19 p11 GSU roll 543276. [S116] Census - 3 Apr 1881, UK Census, ED 2c RG11-5631 Folio 118 p16 GSU roll 1342353. [S117] Census - 6 Jun 1841, UK census, ED 4 HO107-1460;-5 Folio 37 p10 GSU roll 464352. Nicholas LENFESTEY was born circa 1809 in St Pierre-du-Bois, Guernsey, Channel Islands. [S178] Census - 5 Apr 1891, UK census, ED 13 RG12-547 Folio 102 p6. [S923] BDM Registrar of New Zealand, death record, Reg. No. 1944/1193/2156. [S190] Index - GRO and Office of National Statistics, England & Wales Civil Registration Qtrly Indexes, Marriage: District of St George Hanover Sq, Vol 1a, p684, 1Q1889. [S190] Index - GRO and Office of National Statistics, England & Wales Civil Registration Qtrly Indexes, Death: District of Epsom, Vol 2a, p17, 1Q1895, aged 43.